we may make an all-knotted Cord Rosary, sometimes called a Twine Rosary. normally used for rosary making. 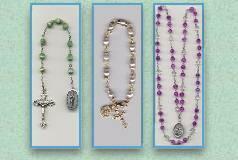 you will need for each particular style of rosary. The beads referenced throughout are common "Mission Beads" 5 x 7mm ovals. Size #9 cord is just the right size for "mission" rosaries made with the plastic 5 x 7mm oval beads. If you are using wood beads, depending on the size of the hole, this size cord should work for your 6-8 mm beads also. 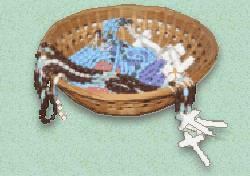 Size #21 is popular for making all-knotted Twine rosary of a smaller length, and for use with Pony Bead rosaries. Size #36 is the very thick style used for rosaries made completely of cord...where the "beads" are formed from cord. This size is used most often for rosaries for our Troops. Size # 9 Cord is available in Bonded and Non-Bonded finish. Bonded Cord is treated with a chemical, that make it feel like it is waxed, to help it hold together - it doesn't unravel as easily, its rather stiff and easy to handle. But if you will be making a number of rosaries every day, this cord can be rough on your skin. Hands may become sore from pulling on the cord to make the knots. Non-bonded Cord is a little easier on your hands, not as stiff, but harder to thread through the beads, and unravels easily. It will fray at the ends when you cut it, so you must use clear enamel polish to help hold it together. Using Bonded or Non-Bonded Cord is matter of your preference. Both are just as strong. Rosaries can be made using only cord with the beads formed out of the cord by typing a special "barrel" knot. The knots can be tied with the use of a tool, or tied using only your fingers.